Fun, craveable desserts—from even-better-than-you-remember-them homemade Pop Tarts and Oreos to brilliant original treats—are the hallmark of pastry chef Hedy Goldsmith. 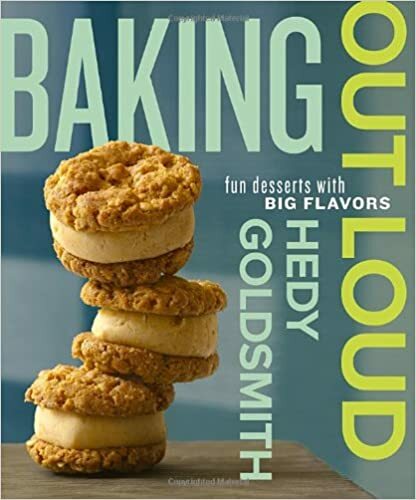 Celebrated in the New York Times and on Food Network for the clever and delicious dishes she creates, Hedy has a sense of humor that comes out in her sweets. Baking Out Loud includes her most sought-after recipes and many more desserts that will inspire home bakers. Hedy grew up on the kind of supermarket treats that are familiar to Americans—Cracker Jacks, Nutter Butters, coffee cakes from Entenmann’s bakery—as well as concoctions from her Easy-Bake Oven. In Baking Out Loud, she not only details how she transformed her childhood favorites into grown-up versions that are irresistible to kids and adults alike but also shares recipes that boast her signature in-your-face flavors. Twinkies were the inspiration for her Red Velvet Twinks, which combine rich chocolate cake and cream cheese filling that has a touch of tang from the addition of goat cheese. Her Chocolate Caramel Peanut Bars are the most indulgent version of a Snickers bar imaginable. And Hedy finally gives the recipe for her famous Junk in Da Trunk cookies (aka Chocolate Chunk Cookies) and Banana Toffee Panini. From cookies and bars to pies, cakes, tarts, custards, and all sorts of ice creams, Baking Out Loud is a whimsical collection of eighty inventive recipes that any home baker is going to love to make.